WASS (Whitehead Sistemi Subacquei), based in Italy, is a world reknowned producer of Light Weight Torpedoes, Heavy Weight Torpedoes, Torpedo Countermeasures and Sonar Systems for Underwater Defence. The WASS Black Shark Heavy Weight Torpedo (HWT), which is shortlisted for the Indian Navy’s upcoming Scorpene Submarines; the WASS A244 Light Weight Torpedo (LWT) being supplied to the Indian Navy; the WASS C303 Torpedo Decoy System (TDS) manufactured through ToT with DPSU Bharat Dynamics Ltd. (BDL), and also offers TDS for Ships as well. WASS is now one of the most important Torpedo producers in the HWT field, being present in Underwater Torpedo Warfare since 140 years, and is the Indian Navy’s Torpedo supplier since 1976, with its latest success being the leading-edge Black Shark HWT, competing for 98 IN systems. This launch is an important milestone in the development of this Next-Generation Torpedo. 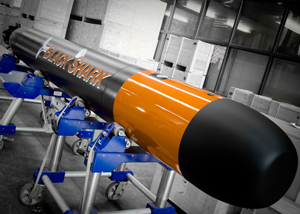 On 28th January 2014, the new Black Shark Advanced (BSA), produced by WASS, a Finmeccanica Company, was launched for the first time ever from the Italian Navy Submarine SCIRE’. The Torpedo launched in “Push Out” Mode (Water Ram Expulsion System, which ejects the Torpedo by means high water-pressure), was equipped in a totally innovative way, thanks to the new Lithium-Polymer Battery. “The Black Shark is the result of Italian Research and Cutting-edge technology,” said Alessandro Franzoni, Chief Executive Officer of WASS. He further said, “this is an example of the national excellence in the field of underwater defence equipment through the use of innovative technical solutions for the Propulsion Systems, Power Generation and Electro-Acoustics. Thanks to its high quality standards it will succeed in all main international markets.” Over the next few years, the Black Shark Advanced is expected to replace the old A-184 Heavyweight Torpedo, now supplied to Submarines of the Italian Navy, increasing significantly the ability to defend the waters and the Italian homeland. WASS (Whitehead Sistemi Subacquei), based in Italy, is a world reknowned producer of Light Weight Torpedoes, Heavy Weight Torpedoes, Torpedo Countermeasures and Sonar Systems for Underwater Defence. The WASS Black Shark Heavy Weight Torpedo (HWT), which is shortlisted for the Indian Navy’s upcoming Scorpene Submarines; the WASS A244 Light Weight Torpedo (LWT) being supplied to the Indian Navy; the WASS C303 Torpedo Decoy System (TDS) manufactured through ToT with DPSU Bharat Dynamics Ltd. (BDL), and also offers TDS for Ships as well. WASS is now one of the most important Torpedo producers in the HWT field, being present in Underwater Torpedo Warfare since 140 years, and is the Indian Navy’s Torpedo supplier since 1976, with its latest success being the leading-edge Black Shark HWT, competing for 98 systems.